I don't think I've made it any big secret around here that I'm a big fan of Crossway Books. Jonathan was joking the other day that most people walk into bookstores and look for the books they are most interested in, in alphabetical order. Me on the other hand? I like to look for books by publisher. Chances are that if Crossway is the publisher, I'm going to find a great deal to value in the book. Therefore it will come as no surprise to you that I really enjoyed Purity: A Godly Woman's Adornment which is an "on the go" devotional book.
. . . Knows What to Value"
The list goes on and there is much to glean from and think about. I found it a very insightful read and prompted me to examine and re-examine the way that I view myself in light of my ultimate goal. And that goal is? To glorify God and to enjoy Him forever. This book questioned my thought processes and challenged me to consider whether or not I am living wholeheartedly for the Lord or if I am holding parts of myself back. I think it's a great temptation for us to want to make decisions that will make us feel good in the moment. We apply our own wisdom to circumstances and situations, claiming arrogantly that we know what is best for ourselves at any given point in time. Instead of asking God what He would have us do, and fearing that He'll ask for something difficult, we charge ahead and close off our hearts to Him. Or, perhaps, this is just me? But if I truly do believe that God knows best (and I do!) and that He has the best planned for me (which I believe He does!) then seeking to have a pure, clean heart before Him is in mine and everyone else's best interests. It's a good word of encouragement (the kick-in-the-pants kind!) to hear that if I fail to seek His wisdom in making personal decisions, it is because I do not believe God to be Who He says that He is. I doubt Him with an impure heart. There were many passages I could list but time and space being of the essence (and a desire to save a little face!) I'm going to stop there and share some fun things which are revolving around the release of this book. 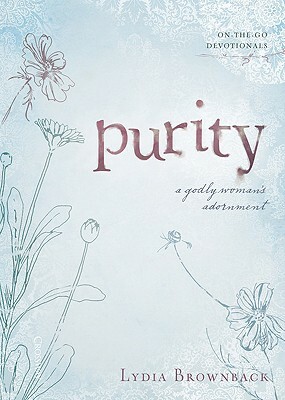 #2 - Crossway Books has graciously and generously offered THREE copies of Purity: A Godly Woman's Adornment to three of you! To win? Simply leave a comment below. This contest will be open through Thursday, June 11th and is open to U.S. Residents only. Again, although this book is labeled "devotional" I don't think it reads exclusively as such. I'm glad to mention this book to you and have the opportunity to host a giveaway of it because I think that we typically discuss "purity" when it comes to our sexuality. I like how Purity: A Godly Woman's Adornment expands on the theme, encouraging women to have a heart relationship with God which is as pure and unencumbered from the snare of sin as is possible. Brownback encourages her reader to seek after God with their whole hearts and I, for one, drank in the encouragement. I think I would use this as a devotional...except on those days when I just can't get enough...then I'd keep reading! I love Lydia. I have the other devotionals she's written. Thanks for the chance to win this one! I just received the one in this series called "Trust" but haven't read it yet. I'd love this one as well -- your initial quote from the book on the definition of purity is probably the best I've heard. This sounds very good. I'd love to win a copy! Wow--that quote was good. It's stunning to think that every time I sin, I'm basically saying that I don't believe that God is good. I love the quotes you shared. This book seems like it would work well with a small community group. My HS girls (I'm the leader of it) are currently just absolutely hungry for God's word and His teachings. I'm growing through "How People Grow" with them right now. I'm always looking for more ideas and I think this "Purity" would be a great one to go through with them. Thanks for sharing! I've read "Contentment" (and will re-read it for the summer book club with my friends at church); I just got "Joy" in the mail. Good stuff! I like Lydia's blog too. Please enter me in your drawing. This looks like a very interesting book. This sounds great. Please enter me. Also wanted to mention that GirlTalk blog (Carolyn Mahaney & girls) will be reading this book. Please include me! I would love this! I would like to read this and I have grown daughters I can pass it on to as well. This one sounds wonderful. I'd love to win it! The parts of the book you shared and your comments are definitely encouraging. Thanks for your honesty. Also, thanks for the chance to win the book. This post hit me where it hurts, so often in these last few weeks/months I run off and do what I think is going to make me happy instead of waiting for God to let me know what He would have me do. I'll have to pick up a copy of this book! I enjoyed your review and would love to read Purity :) *Thanks* for the giveaway! Please enter me in the giveaway. It sounds like a great devotional book. Purity is a topic that needs more attention. I'd like to read this.